The second title in the Focus collection is devoted to the exhibition of works by Picasso organized by ADLAN, which opened in January 1936 in the Sala Esteva gallery in Barcelona and later travelled to Bilbao and Madrid. 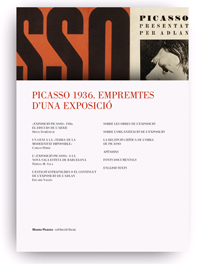 The Museu Picasso's Centre for Knowledge and Research has carried out an exhaustive in-depth study of the documentary fonds, acquired by the museum in late 2009 and early 2010, to allow readers to understand in detail the process of organizing the exhibition, the various individuals that were actively involved, the selection of works the show introduced to the Spanish public and the range of critical reaction it provoked. Like the exhibition Picasso 1936. Traces of an Exhibition, the book places the focus firmly on the narrative force of the documents.